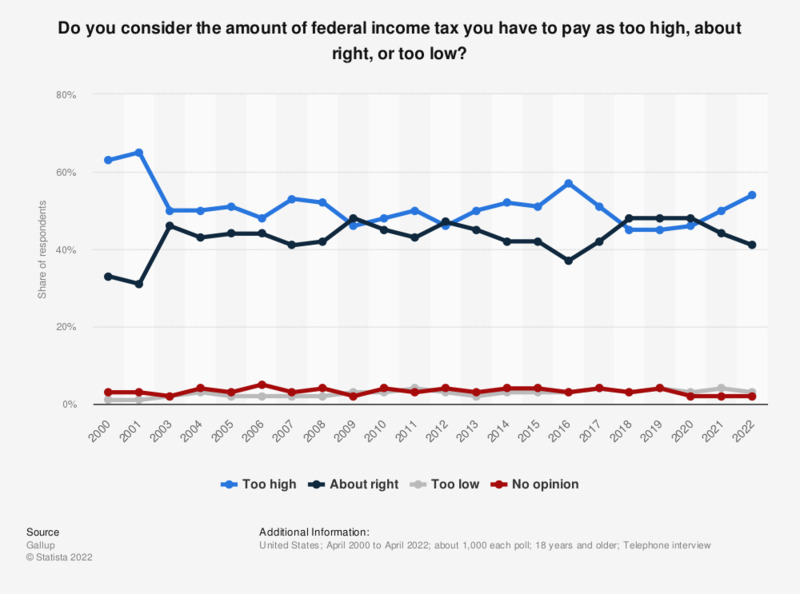 This statistic shows the U.S. public opinion on the height of federal income taxes from 2000 to 2018. In 2018, around 45 percent of Americans perceive their taxes as being too high. The source does not provide figures for 2002. Everything On "U.S. Government tax revenue" in One Document: Edited and Divided into Handy Chapters. Including Detailed References. Would you favor or oppose Congress passing a new law that would require households earning 1 million U.S. dollars a year or more to pay a minimum of 30 percent of their income in taxes? Who do you blame more for the inability of the committee to reach an agreement, the Republicans, the Democrats, or both equally?